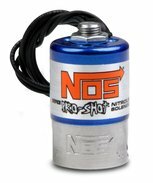 NOS offers great nitrous and fuel solenoids such as Cheater, Powershot, Pro Shot, Pro Bigshot, Super Bigshot, and Sniper. No matter the nitrous system need, NOS has the right solenoid for you. NOS offers a great selection of nitrous and fuel solenoids along with all of the parts needed to service your solenoids. Limited to Stock - Super Big Shot Nitrous Solenoid Rebuild Kit for the old style solenoids. High flow nitrous solenoid with a 0.178" outlet orifice and aluminum base.